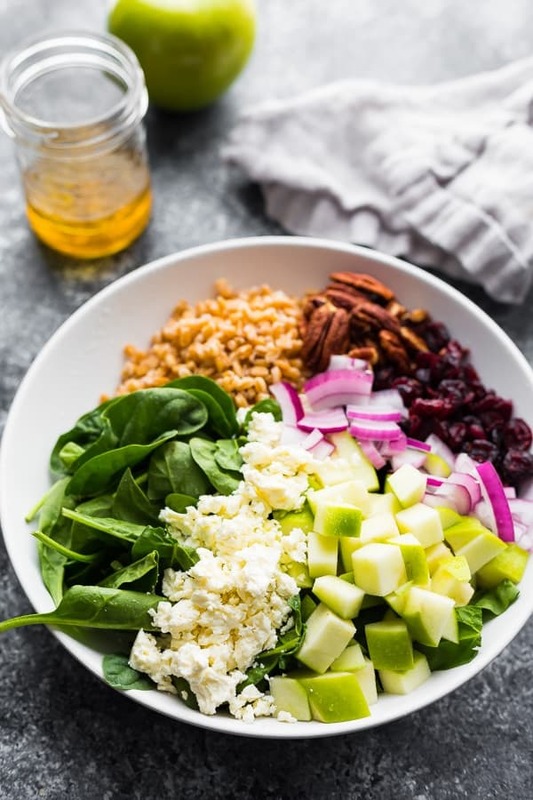 This autumn apple farro salad contains crunchy Granny Smith apples, pecans, dried cranberries, feta cheese, farro and spinach, all tossed in a tangy vinaigrette. The perfect way to celebrate apple season! Craving a sweet/savory/crunchy salad that is full of goodies? Then you are in the right place! 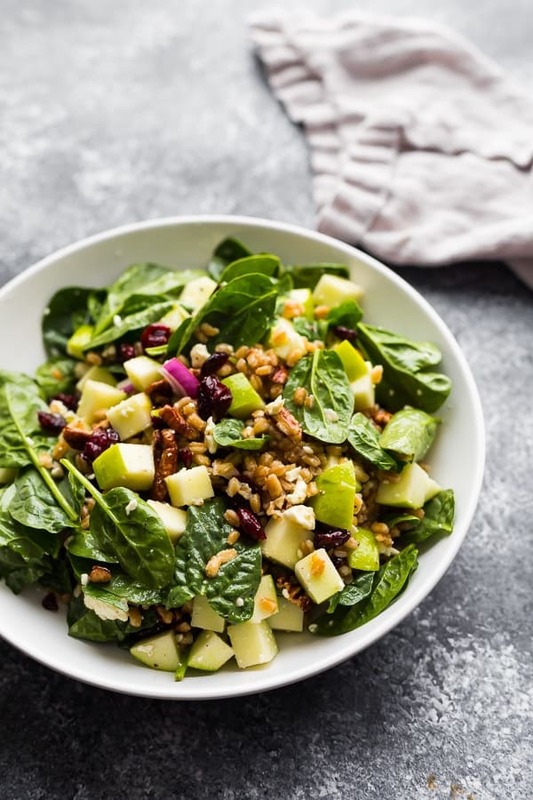 There is nothing I love more than a good salad, and I’m so excited to share this autumn apple farro salad with you today, because it’s so freaking good! I really need to cook farro more often because it is so delicious! Farro is kind of nutty, and a bit more hardy than rice, and has a really great chew to it. It gives this farro salad recipe more staying power, keeping you full for longer! Cook your farro. I’ve successfully cooked farro in my rice cooker, but it took FOREVER. I prefer cooking it on the stove top. Simmer for 30 minutes, then drain off excess water and cool. Your farro must be cool before assembling this salad! Shake up your vinaigrette- I used a simple white wine vinaigrette for this recipe, but I bet a balsamic vinaigrette would be great as well! Toss together all your ingredients! 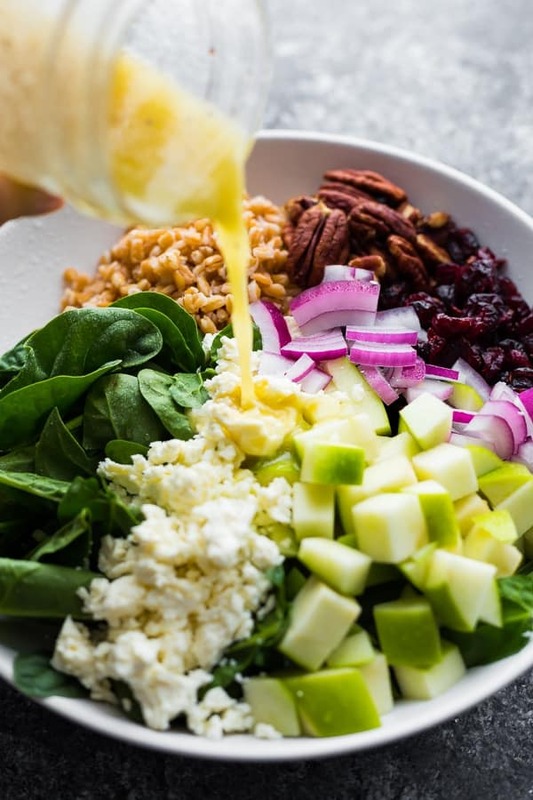 Make sure to chop your apple right before dressing the salad; it actually keeps in the dressing for several hours without browning. 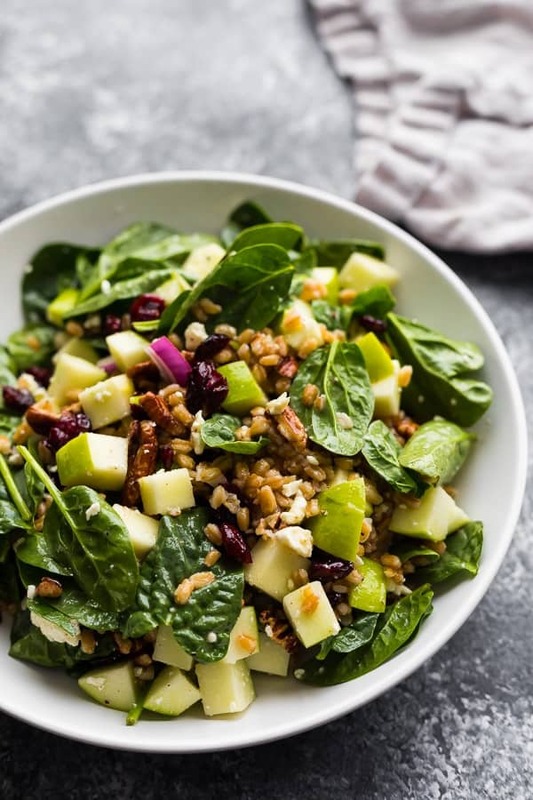 What to serve with this autumn farro salad recipe? We enjoyed ours served with this Herb Crusted Broiled Salmon, but I bet it would also be great with this 3 Ingredient Maple Glazed Salmon, this Perfect Baked Chicken Breast, this Honey Garlic Chicken, or this Sweet Chili Chicken. 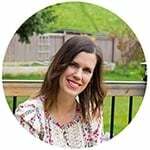 How do I cook farro in the rice cooker? I used the ‘white rice’ setting on my rice cooker and the amount of water listed on the package. It took over an hour to cook but was delicious and perfectly fluffy! Can I prepare this apple salad ahead? This salad keeps OK for a few hours, but it would be better to keep everything separate and dress right before serving! If you’re going to prepare ahead, make sure to chop the apples just before serving for the best flavor and crunch. Cook farro: rinse under tap water for a minute. Combine in a pot with 2 cups of water and 1/4 teaspoon salt. Simmer for 30 minutes, then drain off extra water and allow to cool. Toss everything together in a large bowl, and enjoy! Keep all components separate until just before serving. Do not chop up apple until just before serving. Once dressed, the salad will keep for a few hours, but for best flavor & crunch, enjoy right after dressing. Love this salad! It is so fresh tasting, and the flavourful dressing tops it off so well. Yum! So happy you enjoyed! Thanks so much for leaving a review, Karen! This sounds amazing!!! Do you think you could layer this salad in Mason jars and have for a quick lunch? Love eating filling salads like this for lunches! 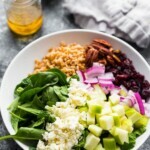 I recently discovered farro, and love adding it to salads!